But it was all worth it. The wedding was lovely; love-filled; such a warm and beautiful and community celebratory event. Everyone helped out and celebrated Sasha and Robin’s love for each other; every single toast (there were a lot) included a statement of the fact that Sasha and Robin are the best couple IN THE WORLD. I agree. 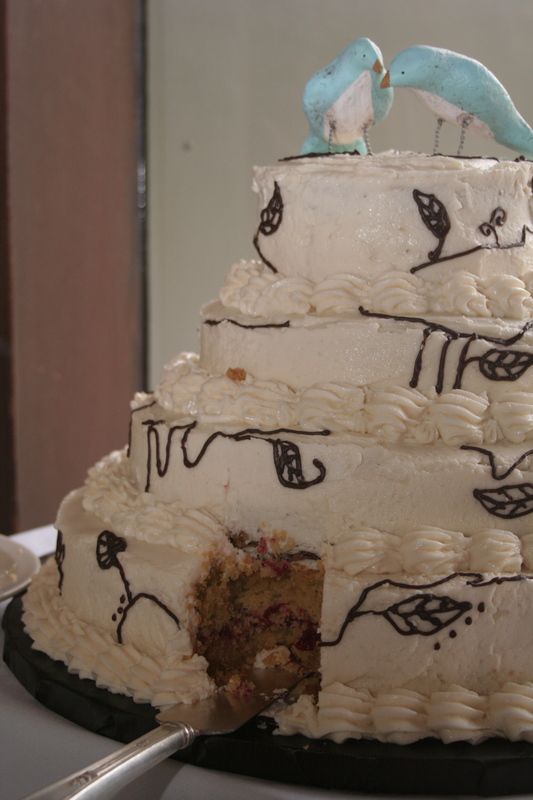 That’s why it was worth it to bake their wedding cake in an oven that was not my own, and have this crazy adventure that I embarked upon. It was totally worth it. 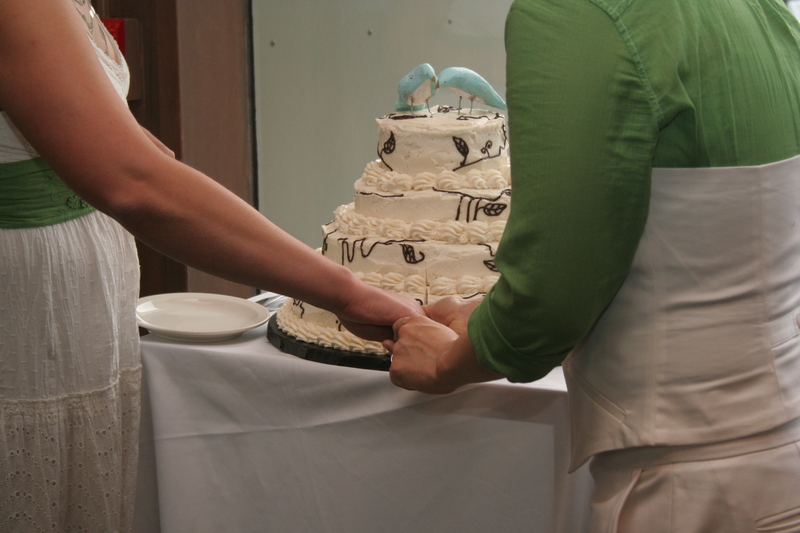 The first thing you’ll need to make a wedding cake is lots of ingredients. LOTS. No kidding, I think we went to at least a dozen stores to find everything, which was ridiculous, because why couldn’t I just find everything at one place like I can here, at Berkeley Bowl?? Life outside of the Bay Area confuses me. Thank goodness I had help from good friends to grate all of this. And peel the ginger. 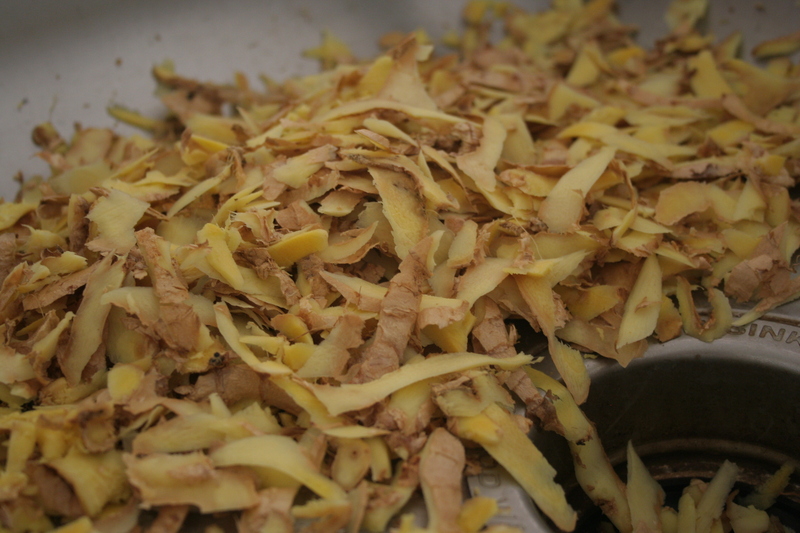 Look, so much ginger peel! 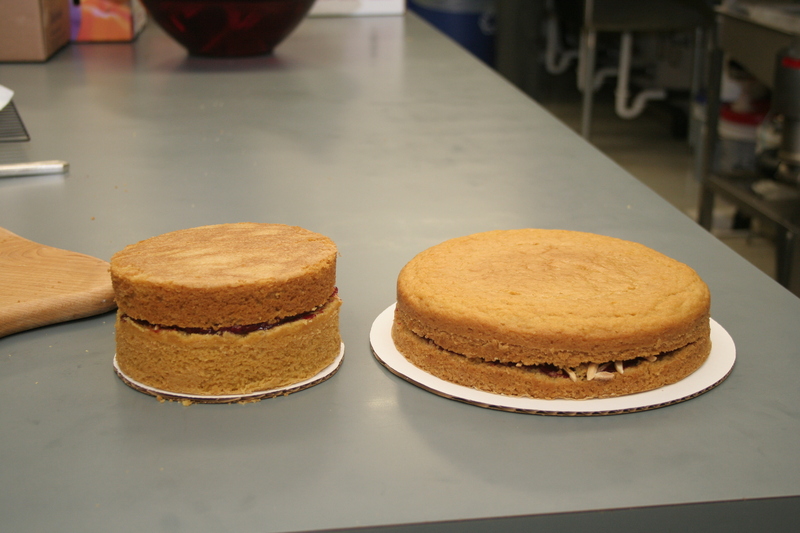 We very carefully sliced each cake in half horizontally. 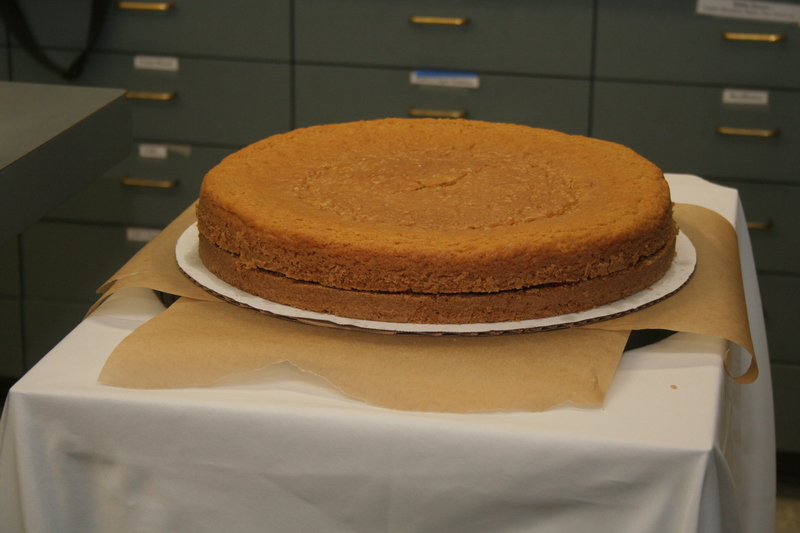 This is the biggest cake (15-inch diameter). This was the trickiest to slice and then lift the top half off, so that we could spread jam and sprinkle toasted almonds in between the layers — I was worried that if we picked up the top half, it would crumble and fall apart. So, I found a very thin large flat cookie sheet, and stuck it between the layers after I sliced them, and then simply lifted the top half off of the bottom, spread yummy fillings inside, and then pushed the top layer off of the cookie sheet and back onto the bottom…It sounds simple now, but it was a very stressful 2 minutes of the cake-decorating adventure! 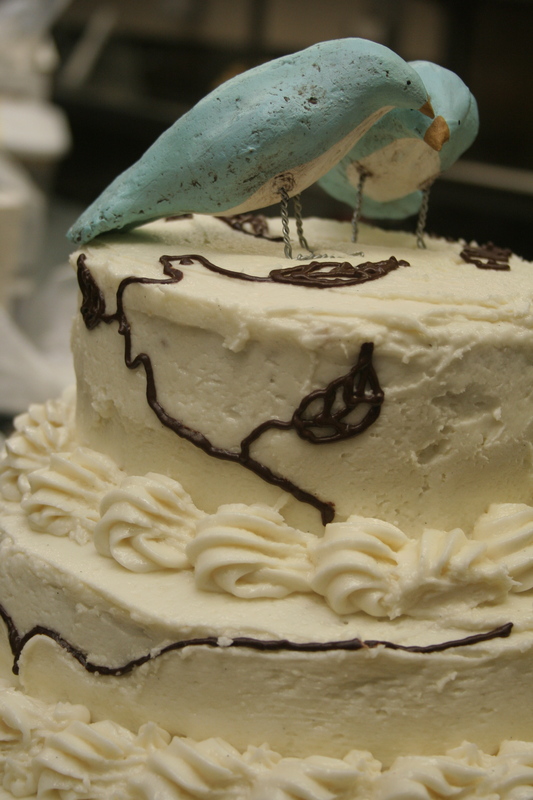 To decorate a 4-tiered wedding cake, you need a lot of frosting. Like the ginger, I mean A LOT of frosting. This bowl was insanely large, filled with an insane amount of frosting. Delicious, yes. Sickening, yes. Amazing, hell yes. 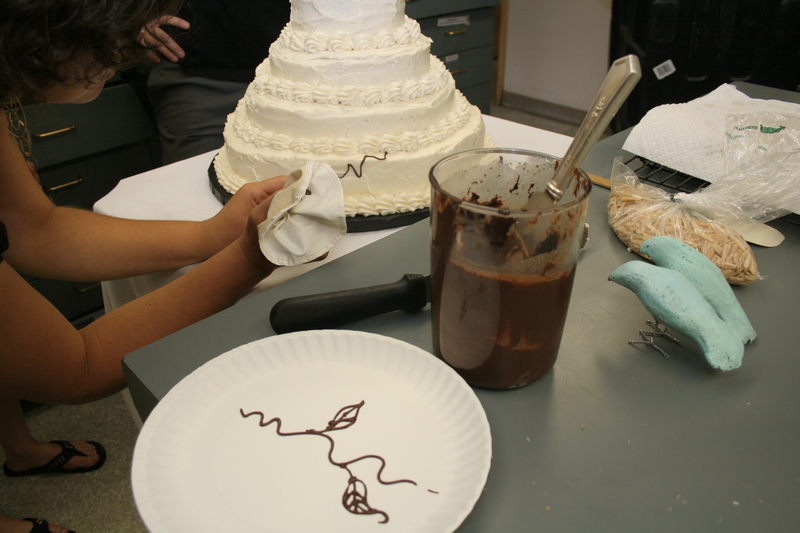 After frosting the cakes on top of each other, I piped thin vines, leaves, and swirls around the cake’s edges, made out of a simple chocolate ganache (recipe below). 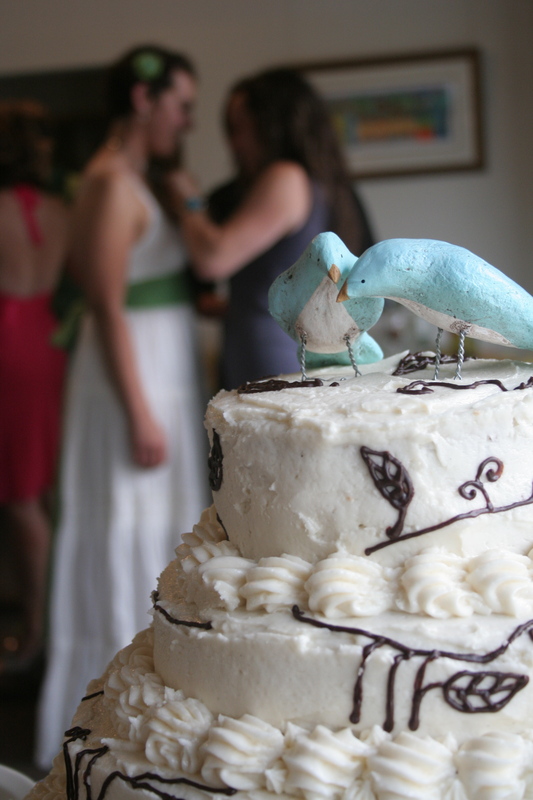 Have you ever seen cuter cake toppers than these little paper mache birds? They were so perfect, nuzzling each other! Thank you, etsy! The moment we’d all been waiting for! The cutting of the cake!! 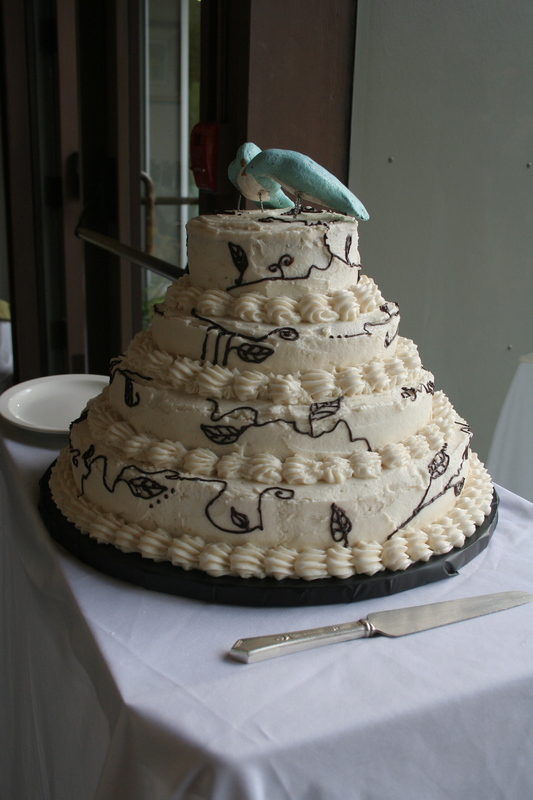 (The cake is the whole point of coming to the wedding, right?…). Preheat the oven to 350º F. Spray a 9-inch cake pan with nonstick spray or line with parchment paper. Or both, if you’re neurotic like I am. Set aside. 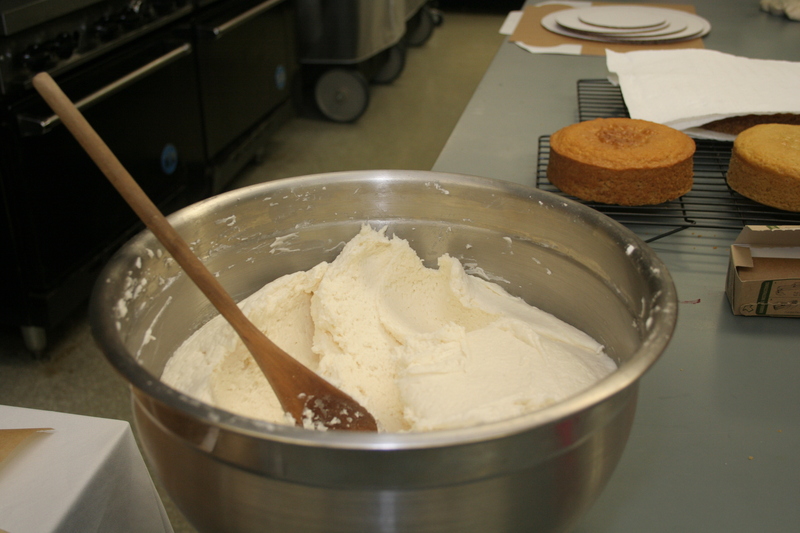 In a large mixing bowl, stir together the flour, sugar, baking powder, baking soda, and salt. 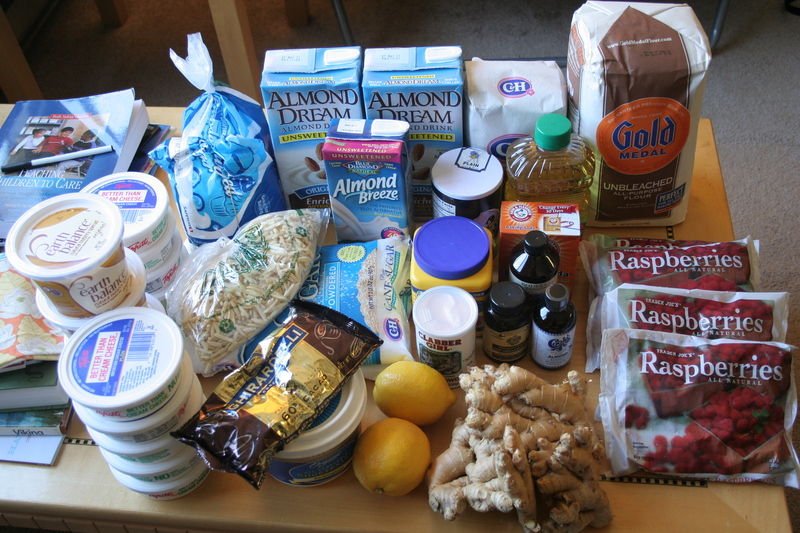 In another mixing bowl whisk together the almond milk mixture, canola oil, vanilla, and almond extract. Add the wet to the dry ingredients and beat until smooth using a hand-held mixer, stopping once to scrape down the sides of the bowl. Add the ginger at the very end, and mix to incorporate. Fill your cake pan with the batter. 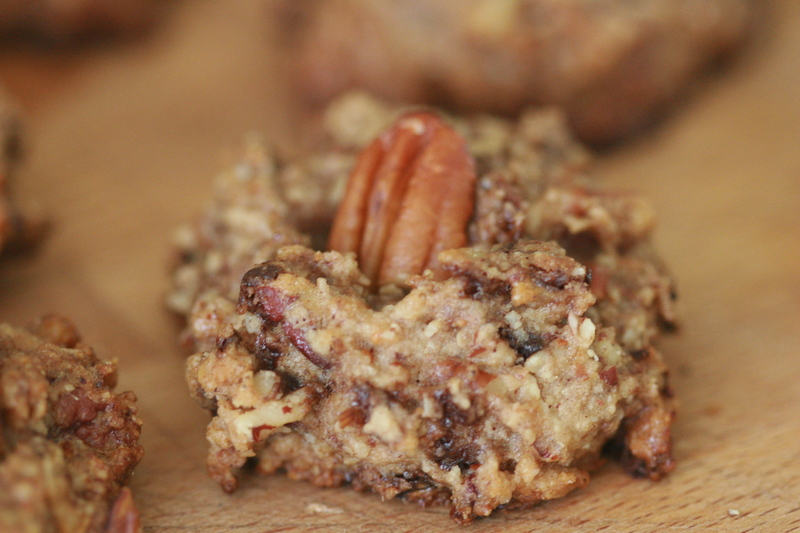 Bake for 35-40 minutes, until a cake tester inserted in the middle comes out clean. Melt the chocolate in a double-boiler. When smooth, pour into a blender, and then pour in your almond milk. Blend on high for one minute, until fully incorporated. It should be quite thin, like a dark, rich chocolate milk. 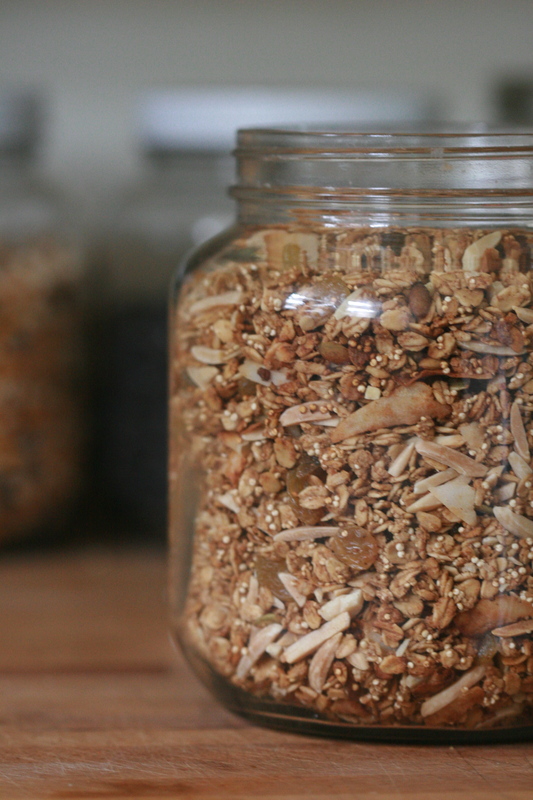 Pour this into a container and refrigerate for a couple of hours, or overnight. 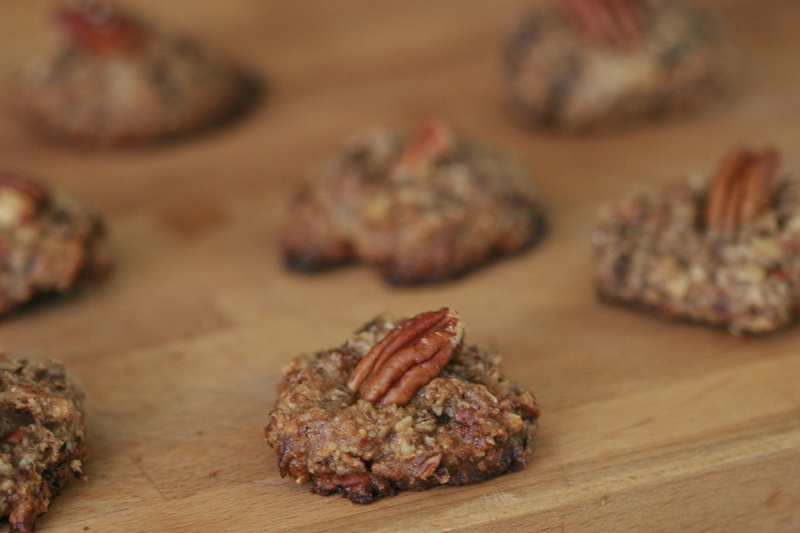 The chocolate will harden (but not completely). 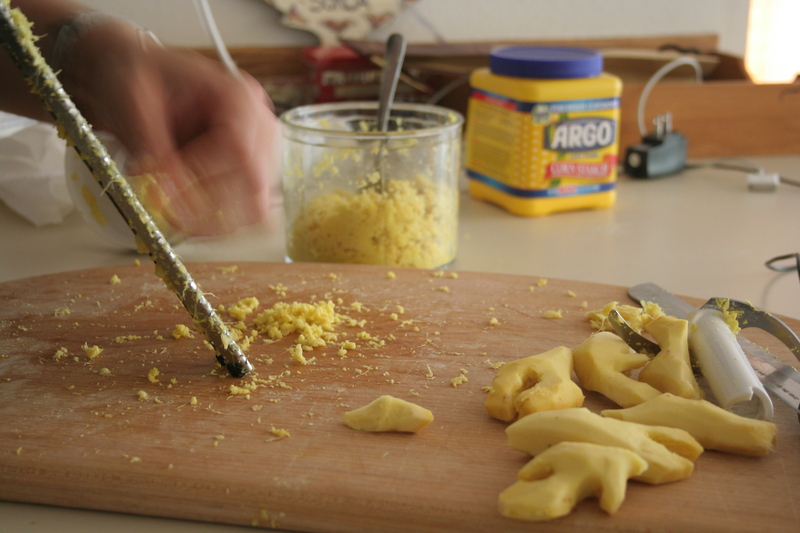 You’ll be able to spread it onto a cake, or pipe it in little decorations. You can fiddle around with this recipe, adding more chocolate will make the mixture more solid after refrigerating it, or more milk will make it thinner.